J.P. La Plante for reviewing prior to publication. The Tse Keh Nay are part of a rich cultural tradition in British Columbia, in which First Nations peoples from coast to interior plateau met at regular intervals throughout the year to trade fish and dried furs. Their nomadic lifestyle meant that they combined elements of both coastal fishing cultures and inland hunting and gathering. The Tse Keh Nay are members of the Sekani ethnic group, today governed by the Takla, Tsay Keh Dene and Kwadacha Nations. Traditional Tse Keh Nay territory includes the Sustut, Omineca, Driftwood, Finlay, and Peace Rivers. 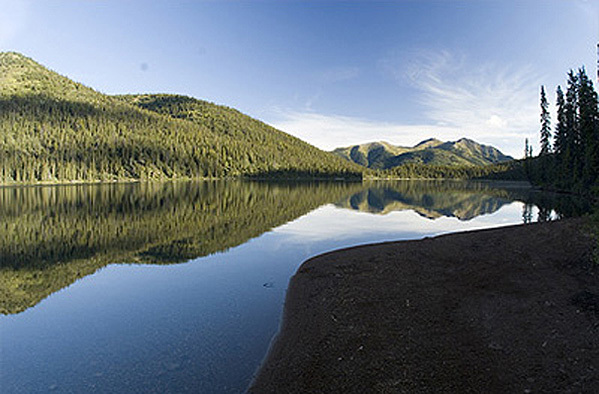 Amazay Lake, a six-kilometer-long lake known to white settlers as Duncan Lake, is at the headwaters of the latter two rivers. It is sacred to the Tse Keh Nay because of its fish and medicinal plants. Tse Keh Nay ancestors, embodied in the distinctive white rocks streaked with black that surround the lake, watch over the people while they bath in its waters. Gold has been the main instrument of change in this region: ever since the first rush in 1855, regular discoveries of gold caused the immediate area to explode with growth for a few years, and then empty out as prospectors moved on. This boom-and-bust cycle destroyed both environment and native ways. The heavy population density during rush times consumed water, plant, and animals resources far out of proportion with the semiarid ecosystem, which had always kept the population of the interior plateau First Nations smaller than those on the coast. When the whites left, the wage income some natives had acquired during the gold rush was lost and the natural resources depleted. The Finlay and Peace rivers also fell victim to the government-constructed W.A.C. Bennett Dam in 1967. The resulting Williston Reservoir flooded Tse Keh Nay traditional villages and hunting grounds. None of the three nations have ever ceded their aboriginal land title or signed a treaty with Canada or British Columbia. However, both governments have permitted corporate exploration and resource extraction to proceed on those lands for generations. Gold prospectors never left British Columbia, and since the 1940s, new technologies allowing the retrieval of microscopic gold particles have led to the far more environmentally devastating method of cyanide heap-leach mining. The major gold mine in Tse Keh Nay country is Kemess South, operated by Northgate Minerals. Negotiations between Northgate and the Tse Keh Nay concluded in June 2006 when the Tse Keh Nay agreed to recognize the right of the current mine to continue its operations in exchange for consultation on future projects and Candadian $1 million per year for their communities throughout the life of the mine. However, Northgate was simultaneously submitting plans for a proposed Kemess North mine. The company is eager to open its second mine because Kemess South is expected to run out by 2008, and it wants to use revenue from the current mine to finance the development of the new mine. Kemess North will have an expected life of 11 years, during which time it will generate a projected 3.9 million ounces of gold and 1.5 billion pounds of copper, making it almost four times larger than Kemess South. For every ounce of gold, cyanide heap-leach mining generates approximately 60 tons of waste rock containing an acid solution that is used to extract the gold. Submerging rock that contains acid-generating sulfides into water is the industry’s preferred method of preventing the chemicals from interacting with oxygen in the air, which creates hazardous sulfuric acid. At Kemess North, Northgate has proposed building a 90-meter-high dam to contain Amazay Lake and then depositing 700 million tons of acid rock in its sacred waters. Thus Amazay Lake would become a tailings pond, essentially dead water and empty of the Dolly Varden char, rainbow trout and mountain whitefish that currently thrive in the lake. Northgate claims it can simply move the fish to nearby lakes. In addition to the loss of fish habitat, groundhogs and caribou are among the other species that will have their habitat disrupted by the tailings pond. The entire watershed is in danger because of flow disruption and the contaminated water that could escape the dam. The town of Kwadacha is also at risk if the dam floods. Despite the centrality of Amazay Lake to the Tse Keh Nay and the mine’s impact on the ecosystem, Northgate refuses to consider alternatives for waste disposal. After declaring in March 2006 that more environmental review was necessary, the Canadian Department of Fisheries and Oceans reversed its decision—notably after a July 2006 meeting with Northgate Minerals officials—and stated that the company’s plans for replacing lost habitat were acceptable. In August 2006, the Tse Keh Nay held a water ceremony at Amazay Lake to protest its impending destruction. Elders and youth bathed in the sacred waters at Amazay to the sounds of traditional drumming and singing and were brushed with medicinal plants from the shores of the lake. The three Nations gathered again in January 2007 to affirm their unanimous opposition to using Amazay as a tailings dump, no matter what compensation Northgate offered. While Northgate maintains that there is no economically feasible alternative for tailings disposal, the Tse Keh Nay wonder why there is not even a consideration of other options, when the current plan means the destruction of more fresh water at a time when freshwater access is recognized as a global problem. The three nations, along with the neighboring Gitxsan Nation, argue that they were not involved in the environmental assessment process: they did not receive promised funds to allow them to study Northgate’s proposal and there have been no hearings in their local communities to facilitate resident participation. Archaeologists hired by Northgate Minerals failed to document the numerous traditional campsites around the lake which would be overwhelmed by the lake waters if the dam were to be constructed. Chief French notes that they “missed culturally modified trees and a lot of traditional camping sites. They were more interested in old tin cans than our 1,300 year-old artifacts.” In response to the inadequacy of company- and government-sponsored archaeologists, the Tse Keh Nay sent a team of professional archaeologists to Amazay in August 2006. In a preliminary inventory over a few days, the archaeologists found eight definitive cultural sites, numerous other “high potential” areas, and one probable burial site immediately adjacent to the lake. The Tse Keh Nay recognize the links between their struggles and those of their northern neighbors, the Tahltan in Klabona, the Sacred Headwaters. The government of British Columbia seeks to demonstrate to the mining industry that it is “open for business” at the same time as it promises a “new relationship” with its First Nations and that the 2010 Winter Olympics in Vancouver will be history’s “greenest.” As with other First Nations, the Tse Keh Nay struggle to find legal precedent that can protect their land. Canadian law holds that Crown Title (settler claims to the land) is subordinate to the Aboriginal Title of the indigenous inhabitants and that aboriginal groups should be consulted before the government can sell the resource extraction rights to a company. However, the federal government has yet to complete negotiations with First Nations people in much of Canada, including many nations in British Columbia. The provincial government maintains that until the questions of title are resolved, it has the right to issue permits and leases without the permission of indigenous communities. The decision about Kemess North will result in an important precedent for the regulation of other mining projects in British Columbia: a headline in the winter 2006 newsletter of the Mining Association of British Columbia read, “Kemess Mine Expansion Will Set the Standard.” In September 2007, a federal-provincial review panel recommended against the project, writing that the conversion of Amazay Lake into a tailings dump is “not in the public interest” and that “both the Gitxsan and the Tse Keh Nay have stated that water is sacred to them, and that the destruction of a natural lake goes against their values as aboriginal people.” The panel’s reasoning places sacred land issues on par with environmental concerns, which is indeed an important precedent in Canada. Politicians may still overrule the panel’s recommendation, but combined with the 2005 Supreme Court directive towards “meaningful consultation” with Aboriginal people, the momentum appears to be heading in the right direction. Write to the following Canadian officials to state your support for a true consultative relationship between provincial and federal government and the three nations of the Tse Keh Nay. Remind them that the 2010 Vancouver Olympics will provide an excellent opportunity to showcase progress in sustainable resource management and Aboriginal title. Premier Gordon Campbell needs to make good on his promise of a “new relationship with First Nations and Aboriginal people” by setting an example at Amazay Lake. Support the No Dirty Gold campaign—tell jewelers and activists that Northgate Minerals needs to be added to the “No Dirty Gold” list of companies destroying indigenous cultures, lands, title and rights. MiningWatch Canada. “British Columbia.” MiningWatch Canada. Takla First Nation, Tsay Keh Dene First Nation, and Kwadacha First Nation. Tse Keh Nay. Takla First Nation, Tsay Keh Dene First Nation, and Kwadacha First Nation. “First Nations welcome ‘brave recommendation’ from panel reviewing Kemess Mine expansion.” News release, September 18, 2007. Wonders, Karen. First Nations: Land Rights and Environmentalism in British Columbia.